Potts & Pans frequently gets invited to cultural events. We’ve been known to play at general cultural fairs and parades, frequently have performed at Caribbean festivals, and have even found our way into repeated Oktoberfest events. 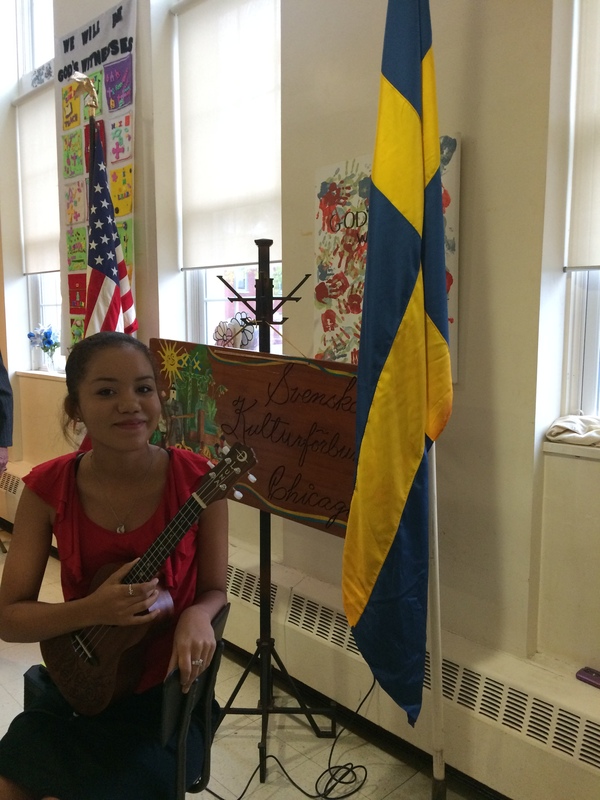 Yesterday, we were thrilled to be part of the Swedish Cultural Society of Chicago’s October Meeting. After club organizer Per-Hugo Kristenssen saw us perform at the Park Ridge Library, he contacted Matt and was excited to have us play for the Society. Matt and I had the plan together for our regular Potts & Pans duo performance, but as we so often do, realized a way to make the performance even better for our client. Anna “Cammie” Howell, member of our community band who you may remember from GLSF15 performing “Song of Sunrise” with the P&P Professional group, is half Swedish! She also happens to be a rather accomplished uker. All in all, Anna was the perfect way for us to fill out a trio for the Swedish Society. So, as Matt and I were heading out to our various performances on Saturday (Matt had a wedding, and I was playing Timpani in Libertyville), I called Anna and asked if she would be available for a performance with Matt and I the next day. An hour later, she stepped up and said she was good to go – Three cheers for Cammie! That being said, there’s a reason one of our Community Band hashtags is #cammiefreaksout. When she first arrived to the shop in the morning, Matt and I were bombarded with a long and exaggerated explanation of why she chose black skirt over black pants for the performance. We were able to calm her down and discussed instrumentation options. Anna would stay on Uke, while Matt and I traded sets between Cajon & Seconds. And although it remains that #cammiefreaksout, she did an excellent job jumping in on all of our music in a single rehearsal. And off to Chicago we went! 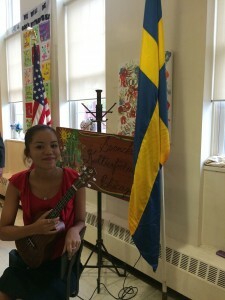 The Swedish Cultural Society meets monthly at the Irving Park Lutheran Church. 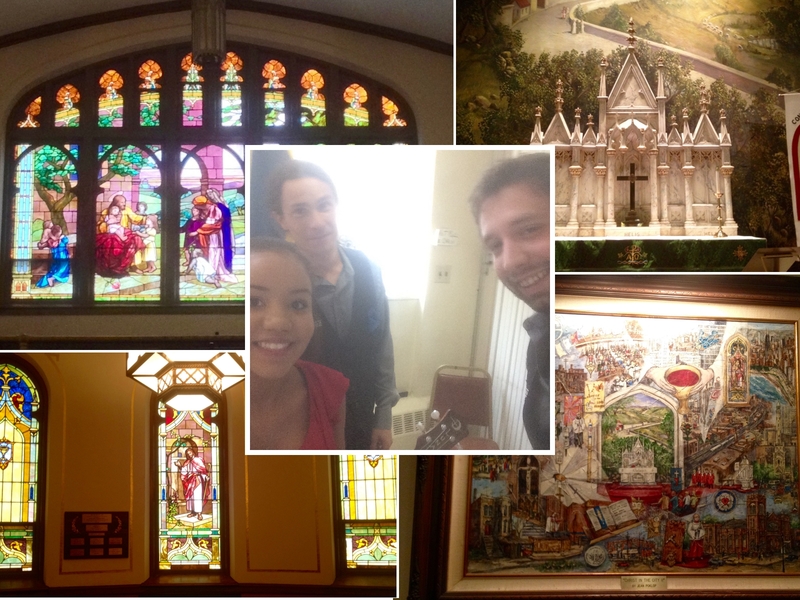 This church was absolutely gorgeous. 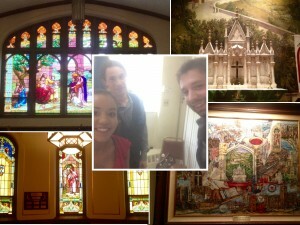 Beautiful Tiffany stained glass windows and an elaborate marble carving made standing in the sanctuary a stunning experience. Upstairs in the reception room, we set up for our performance, while the Society set up for their meeting. Amongst their set up stood a full size United States flag, next to the Swedish flag. Per-Hugo knew the history of these particular flags and told us how that US flag had been flown over the capital building in Washington, and the Swedish flag was personally delivered to the Society by the King of Sweden! Before our performance, the Society held their monthly meeting, going over financial details and discussing future events. The meeting was flavored with historical stories that Per-Hugo was well versed in. It quickly became clear that he was quite educated in both US and Swedish history, along with most countries that have interacted with either nation! It’s not every gig that comes with a free history lesson – anyone wanting to learn some should check out the Swedish Cultural Society’s next meeting on November 1st! Once it was time for our performance, we brought in a few history lessons of our own. The Society was thrilled to hear how the steelpan came to its invention in Trinidad & Tobago, and how the instruments are built and tuned. 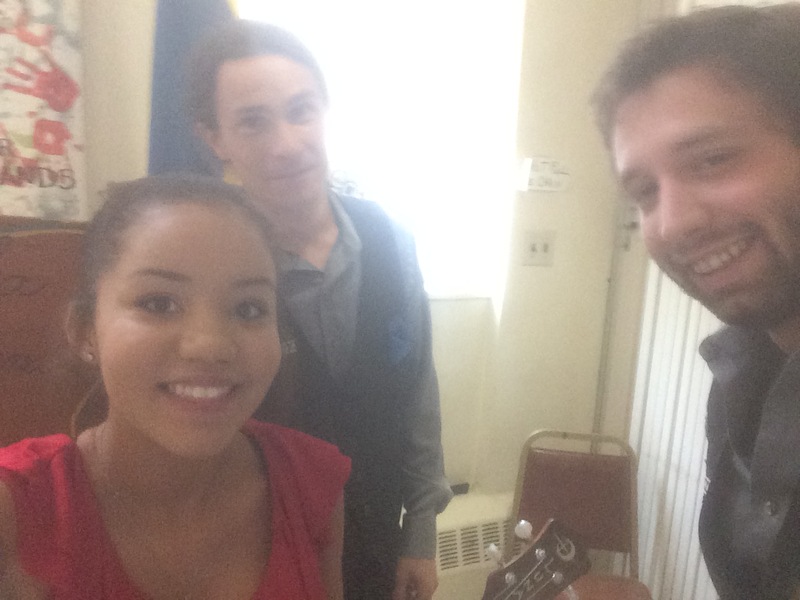 We played calypsos, socas, american rock, jazz standards and bossa charts. We set up my Cajon from TheBoxKit, along with both our sets of seconds with the uke inbetween. The members asked us questions throughout, and were pleasantly interested in the information we had to share, as well as pleased with the music we had to play. Per-Hugo shared more about the countries he’s studied or the stories he’s heard, and then Anna taught Matt and I a few words in Swedish! The performance ended and we enjoyed coffee and light Swedish fare while getting to talk with the members a bit more about our music as well as the dealings in the Swedish Cultural Society. Overall this performance was a wonderful trade in knowledge, and having such an attentive audience who enjoyed our music so much made it even better. On the way home we stopped at Olive Garden, a band favorite due to Matt and my own love of endless breadsticks, and grabbed dinner for the three of us. Excellent performance finished, we were again reminded how #cammiefreaksout, only this time we witnessed her go into an endless stream of helpless laughter! Regardless, dinner was a delicious end to a wonderful performance. We went home, and are looking forward to our next adventure. Be sure to follow us on Facebook and Twitter so you don’t miss all the action!